FC Monmouth plays in the National Premier Soccer League (NPSL), a semi-professional, Division 4 soccer league with almost 100 teams nationwide. We belong to the Northeast Region and compete in the Keystone Conference with eight other teams from both New Jersey and Pennsylvania. For local players, FC Monmouth is an opportunity to work with experienced coaches and get high-level game exposure to advance their career and realize their dream as a professional soccer player. Our games are live streamed and highlights are broadcasted. Our second season begins in May 2019. We have good memories of 2018. 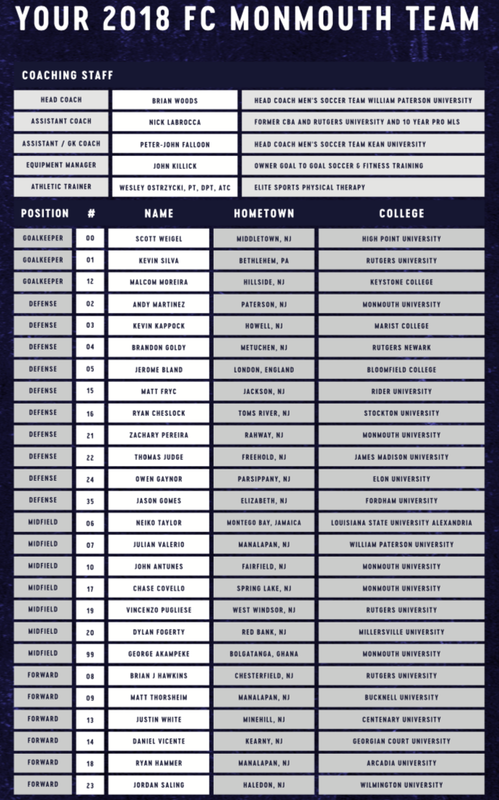 See below the players that represented Monmouth County, NJ in our inaugural season, where we made the playoffs and went undefeated at home.